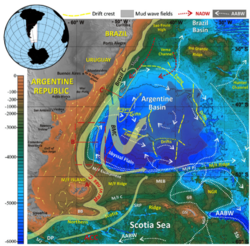 The Argentine Continental Margin (ACM), one of the largest margins worldwide, is a complex feature where geotectonic evolution and the post ocean-opening history configured three types of margin: passive volcanic rifted (Type "E"), transcurrent (sheared, Type "F") and mixed (convergent and sheared, Type "A+F"). Apart from its implications in the evolution of the Southern Ocean, the ACM constitutes a key region in the global oceanographic-climatic system as it is the only place in the Southern Ocean with a net water-masses exchange between equatorial and south polar regions. Strong Antarctic-sourced currents run along the margin driven by the Coriolis force from 56°S reaching regions up to at least 34°S or even farther North. Margin evolution has been affected by climate, current, sea-level, tectonic processes and by sediment input patterns and history. All these characteristics, added to the fact that this is a critically important but under-sampled portion of the global ocean conveyor belt, provides a strong call for IODP scientific drilling to recover important records and sediments that lie within the "passive" sector of the margin (APVCM).